Roadside work is dangerous. Between 2008 and 2017, 12 roadside workers were killed and 218 were injured and missed time from work1 as a result of being hit by a motor vehicle. As an employer, you’re responsible for the safety of your employees who work in roadside work zones. With proper training and resources, roadside workers can keep themselves and others safe. The following tools and resources will help you keep workers safe in roadside work zones. The focus is on roadside work where planned work does not exceed one daytime work shift and certified traffic control persons are not required. Choose an option below. Working close to traffic can be dangerous. This resource provides a list of potential hazards that may be present when working on or beside the road. The BC Traffic Control Manual includes a number of traffic control devices beyond signs, cones and barriers that can help to mitigate traffic exposure risks. When used in combination with other safety controls, these devices can help reduce the risks of a worker being struck by a motor vehicle. 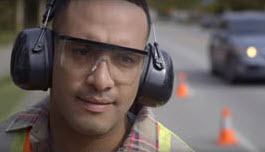 This tool outlines what employers need to do to keep employees safe when working on or beside the road. The Occupational Health and Safety Regulation (OHSR) requires that every BC employer must ensure that effective traffic control is provided and used whenever traffic could be hazardous to a worker. This resource can be used in tailgate meetings to help you talk to your employees about key elements of a work zone layout, and things to consider in the proper set up and dismantling of roadside work zones. This tailgate meeting guide outlines how to assess the risk and determine when traffic control is required for emergent and brief duration work. Roadside safety tools and resources provided by other organizations.